Reynaldo R. Cancio is the current Director of National Policy and Planning Staff in National Economic and Development Authority. 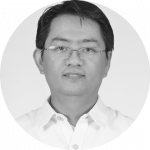 He obtained bachelors degree in Business Economics and Master of Arts in Economics both from University of the Philippines School of Economics. He also studied Doctoral Programme in Economics with 45 units from UP School of Economics. He used to work as a Senior Economist in European Union Delegation to the Philippines for 15 years. He wrote main papers such as “Competition Policy and Legislation in the Philippines”, “Government Procurement in the Philippines”, Customs Reform in the Philippines”, and many more. He attended local and international trainings from United Nations, International Monetary Fund, European Commission and Asia-Europe Foundation.